Surprisingly under reported there was a massive knife attack in China this weekend. Approximately 10 men, described as Muslim separatists from a northwestern state, ran into a busy train station randomly attacking innocent people. Half of the assailants escaped while four were killed by police and one was captured. I just have to think that had this been done by a nut job with a firearm, the media’s hoplophobia would have kicked in demanding more gun bans. Oh, but that’s right, guns are already banned in China, yet dozens of unarmed victims still die at the hands of evil? How about that? What if 10% of the victims had been armed with a concealed handgun? Would this had even happened? 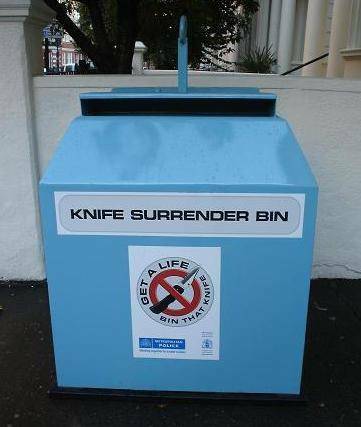 Yet meanwhile in the UK, we see the move to outright demonize and ban KNIVES with new “Turn In Bins”! Logic is dead.